caught this one in the parking lot of the Save-a-lot in mcconnellsburg today. couple other smaller box trucks there, the kind that are about the size of a Uhaul ford 350. the store for some reason had no power, so i guess the other trucks were there to get frozen stuff out of there, leetering on the side said something about a food warehouse or distributor. anyway, this was the biggest truck there so it was the one that got its picture taken. Ray - there are about 100 of those trucks from CFI that a company called Expediter Services owns. 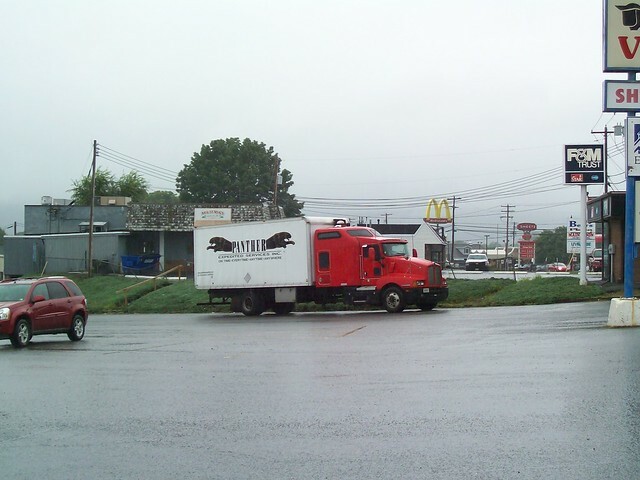 They have them leased to Panther and FedEx Custom Critical (they pulled all their trucks from Tri-State). When a new team comes on board with Expediter Services, they get to pick which company they want to drive for. Expediter Services is also now running tractor trailer units as well, but I do not believe that they are the red T600's. At one time, they had around 50 trucks just leased on to FDCC alone while I was there (that was when they split their Tri-State fleet up between Panther and FDCC). There are some nice red T660s running around as well. I remember seeing them running around for Tri-State. They looked right with the Tri-State log on the side, so it's a shame that deal went south. I'm sure the new FDCC logo will looks good. caught another one like it this evening right before it crossed the turnpike bridge.